Ruins the value of the figure I'm so glad I got my Biollante with the card used. When I was younger, I only had 2 Crapmasters.. ere uh.... 2 trendmasters.. both of them were Godzilla..
Whatever are you talking about, ruining the value of the figure?? This figure is worth much more then the carded figure irrespective of what you are saying, simply because it is a hand-painted prototype and a paint master sample. Baragon wrote: When I was younger, I only had 2 Crapmasters.. ere uh.... 2 trendmasters.. both of them were Godzilla..
God, so many fond memories of these guys. I recently managed to unearth the 4" Godzilla from the 40th anniversary pack in a old package of LEGO's. The poor thing is caked with dust but still rather intact in terms of paint and sculpt. Durable little guy. Question, has anyone owned/still owns the Trendmasters SpaceGodzilla Microset? The thing to my knowledge is ungodly rare and even when I was a child, I never came across it in stores, or should I say KB Toys. Curious to see if people own it. Last edited by trendmasters on Sat Mar 01, 2014 4:53 pm, edited 1 time in total. Last edited by trendmasters on Sat Mar 01, 2014 4:57 pm, edited 2 times in total. I just noticed that most of the Trendmasters GINO toys had him upright with his tail on the ground. Even they tried to make the design more accurate than the movie did. Simple misunderstanding here. I don't think he read that it's the paintmaster. After all, there are people who try to charge $100+ for a regular Biollante. S'all good. Anyways, just snagged that colorful Gamera from ya, Trendmasters. Couldn't pass it up, though it took quite a bite out of my wallet. Sorry NECA, won't be getting anything from ya for a few weeks. 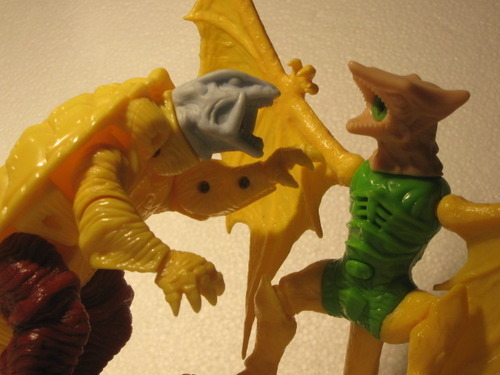 Mr. X wrote: Anyways, just snagged that colorful Gamera from ya, Trendmasters. Couldn't pass it up, though it took quite a bite out of my wallet. Sorry NECA, won't be getting anything from ya for a few weeks. How is he? It and the SpaceGodzilla figure are the only two of Trendmasters' that I was interested in. Literally just won the auction, so I don't know yet. And I don't have the retail version, either. But from what I've seen/read, the Gamera figures are pretty cool. Paint is really nice, and the sculpts, IMO, are pretty good-looking. Like Heisei versions of the Showa monsters. Probably unfair of me to recommend something I don't yet have, but... I recommend it. Now that I have the prototype, I guess I have to get the retail version, don't I? Mr. X, all the Gamera protos were just re-listed and at a cheaper price... I need to move these, as much as I have enjoyed them. If there are any others you are interested in, we can talk. trendmasters wrote: Mr. X, all the Gamera protos were just re-listed and at a cheaper price... I need to move these, as much as I have enjoyed them. If there are any others you are interested in, we can talk. Ah... if I could afford more I would. Hm... I'll have to see. I'll get back to you later this week, see what I can do. Mr. X Wrote: I'll have to see. I'll get back to you later this week, see what I can do. Well the thing is... you can save on shipping right off the bat, if you want something else, and I hold off on shipping the Gamera to you yet. You decide and let me know. I was planning to ship you the Gamera tomorrow, but now I might as well wait and see if you want something else. And if you do, tell me which one and I can stop the auction and sell it to you direct, cool?? And now I have a colorful Gyaos as well. I literally heard my wallet screaming as I made the purchase. No Pacific Rim figures for me. But it was worth it, as these are, well, prototypes. Most companies destroy these things. Really decent prices considering the rarity of these, and the history behind them. If I was made of money, I'd get them all in a heartbeat. If anybody's on the fence, I think you should pull the trigger. You'll never see these again. This is from a St. Louis newspaper (St. Louis Post Dispatch) in May 1995. I was too young to appreciate it at the time but now I get major kicks out of the fact that Trendmasters was right across the river from me. Received these today. Very neat and welcome additions to my collection indeed. Quite new here, but have been a Godzilla fan for years! I am very interested in purchasing some of these, particularly the Doom Island variants. Ebay Rarely carries them, so where should I look to buy them from. Those photos are incredible!!! Great find you guys! 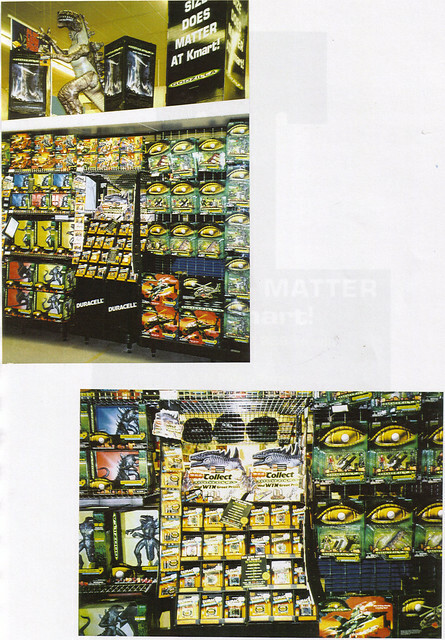 Any idea which store that is starsteam? IN GARETH EDWARDS WE TRUST!